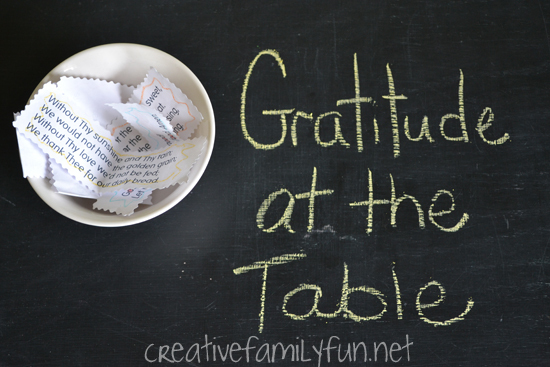 So many of my family and friends are focusing on gratitude the month of November. While I believe gratitude should be practiced year-round, I love the special focus that Thanksgiving brings. I want to share with you a special way we’ve incorporated gratitude into our daily life. I know some people say a blessing before every meal. We didn’t. 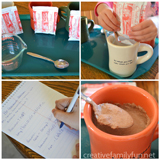 It’s a wonderful habit and one that I wanted to incorporate into our nightly meals. Instead of selecting one particular blessing I chose several from the many traditional blessings that are said across the world. The wonderful thing about saying a blessing is that it crosses all boundaries, both religious and cultural. I chose from my childhood and my life in the Christian church. I selected five blessings that I loved, and typed them up so that they were easy to read. I cut them out and now we keep them in a little bowl at our table. Each night the girls take turn choosing a blessing and we say it before eating. I love how this sets the tone for dinner. Instead of shoveling down our food or playing too much at the table, dinner has been more peaceful. This little change has been a huge blessing to our life. My idea was not original. 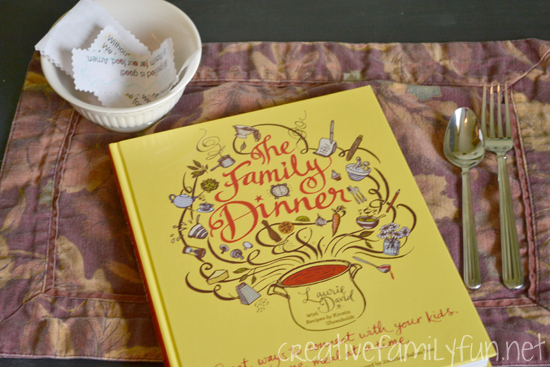 I found it in the pages of The Family Dinner: Great Ways to Connect with Your Kids, One Meal at a Time by Laurie David, a book that has been truly inspirational to me in more ways than one. She devotes an entire chapter to gratitude at the dinner table. I have poured over the discussions and ideas in this chapter several times. My take-away was our gratitude bowl. 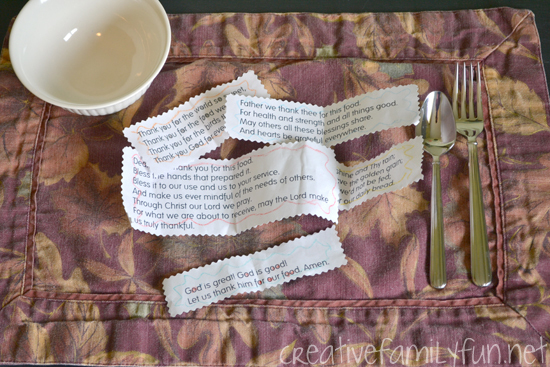 Saying a prayer before dinner isn’t the only way to show gratitude at the table. Many religions already have practices, but even if you’re not comfortable incorporating religious practices at your table, the act of showing gratitude for your food can be incredibly valuable to both you and your kids. 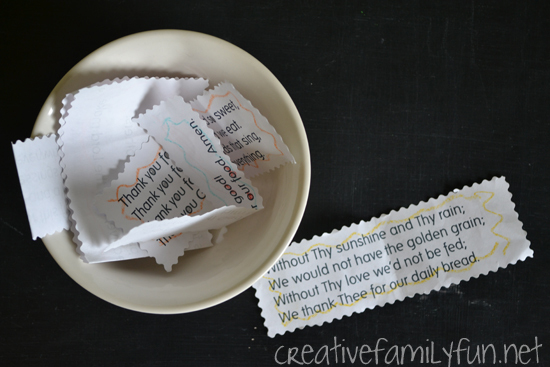 Here are a few additional ideas for showing gratitude. Go around the table and have everyone share their highs and lows of the day. Talk about gratitude in conjunction with those highs and also find ways to be grateful for the lows. Find quotes about gratitude. Print them out and share one nightly or even weekly before dinner. You can find many quotes at Quote Garden and BrainyQuote. Have each person share something they are grateful for. 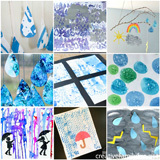 Is is family, friends, or even sunshine after a string of rainy days? 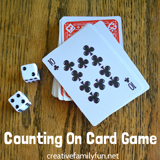 November is the perfect month to start practicing acts of gratitude with your family. Do you say a blessing before your meals? How else do you show gratitude at the dinner table? That's such a lovely idea. I don't celebrate thanksgiving as I'm in the uk but would be a lovely thing to do any time of year. A beautiful post. We share our favorite part of the day during dinner, but I would love to make a prayer more routine. Thank you for the inspiration. This is such a wonderful post! 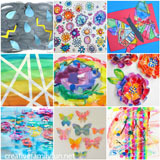 I love the idea of incorporating many different blessings and I love that you gave more secular ideas. This is such a great way to foster gratitude and connect as a family. Thank you so much for sharing it with us. Oh! And I think I *need* that book. This is a lovely idea! I will have to look for the book! 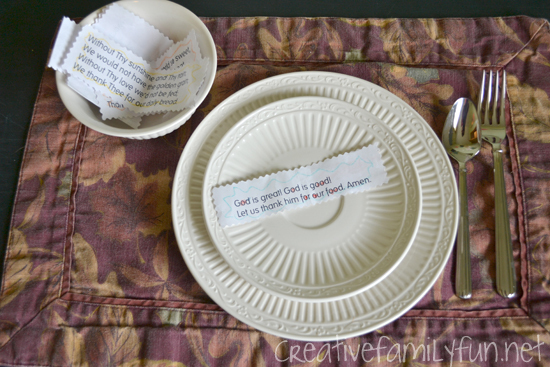 I just love this idea ~ especially incorporating different blessings from around the world. Pinning this so that we can remember to start focusing more on gratitude during the coming holidays!